Potlucks are such a wonderful time. What’s better than getting together with the people you love to share food? Not much. For most people, it’s an opportunity to show off some culinary prowess and impress guests with deliciously addictive recipes. When it comes to eating healthy, a potluck isn’t the worst considering you have SO much to choose from. However, it can be tough. Often, cooking for a party requires meeting the host’s requirements. You might be in charge of a certain type of dish or a specific recipe. What if it’s NOT so paleo? Well, we’re sure you can figure it out. Instead of having to do the research and put in the legwork, we’re talking paleo potluck recipes today. From the salads to dessert, we’ve got grain-free, dairy-free, refined sugar-free potluck and picnic classics for you to rely on through every season, and for every occasion. Salad takes on a wide range of food combinations and flavor possibilities. We’re not just talking iceberg lettuce, either. These salads are quite literally dressed to impress. Your guests are going to want to eat their veggies with these recipes. Potato salad is fine and dandy, but it can be pretty heavy for being a side dish especially. This recipe lightens things up bringing in those classic flavors – the crunch, the smoke, the spice – without all the starch! A blend of sweet potatoes and cauliflower make up the bulk of this creamy salad. It’s versatile, and it’s easily served throughout all of the seasons. Make this your go-to potluck salad. Broccoli slaw is simple, satisfying, and it’s easy on the eyes with its beautiful green hues! It just looks fresh. This salad boasts equal amounts of flavor and texture for a veggie dish that is highly addictive. You could easily sub out broccoli for cauliflower, too, or use a blend of both. The cranberries add some chewiness and sweetness. You could add fresh fruit to the mix if you like, too. Pasta salad is often found at the potluck table, but with all those grains and heavy mayo, it’s another not-so-healthy dish! This “pasta” salad changes things though. The base features zoodles, and it’s packed up with crunchy green pistachios and tender chicken. You get plenty of healthy fats in whole keeping it low-carb and without spoiling your appetite. If mayo-based salads simply aren’t your jam, perhaps warm bacon dressing salads are. This gorgeous blend of tender, multi-colored potatoes, fresh asparagus, crispy bacon, and drizzled bacon grease is a winner. You could easily sub out potatoes for sweet potatoes if you prefer or are avoiding nightshades, and you could replace asparagus with broccoli during the cooler months when it’s not in season. The dressing, though? Don’t even think about it! You just can’t go wrong with it. Coleslaw is a winner. It requires minimal ingredients and no cooking, plus it’s delicious! Opt for an avocado oil-based mayonnaise instead for a deliciously unique taste. Add in some shaved jicama or apples for a little something new and exciting, or add in seasonal herbs and ingredients that blend with the cabbage and carrots well. Add some flair to it or just keep it simple – it’s up to you. Finger foods and easy-to-snag snacks are the first to disappear on any potluck table. Let your recipes be the shining star! Of course, everyone is waiting on that main dish, but providing something to tide hungry bellies over is the ultimate act of party service. This dip is comparable to hummus but without the legumes, making it totally paleo-friendly. Dips are a potluck must, and having something you can feel good about dunking into is important for keeping hunger at bay! You can easily pair this gorgeous, flavorful, hazelnut-infused roasted cauliflower dip with raw veggies, some seed crackers, and crusty bread for guests. This is a tasty crowd-pleaser. Pinwheels are a party HIT every single time. These ones skip out on the tortilla in favor of grain-free collard green wraps instead, making them suitable for low-carb and gluten-free diets alike. You can fill with any meats you like, and even add some cheese to the mix. This recipe features a cream cheese made from nuts for those who want to keep it 100% dairy-free! Corn dogs aren’t just for kids! These muffins boast no corn or any other grains, but still encompass that nostalgic corn dog awesomeness. A little bit of crunch, the fluffy inside, and of course the meat! This is a great option for a party with picky eaters or turning someone on to “healthy” junk food. These are going to go fast! This creamy base is made possible without dairy, and instead with cashews. There’s also some healthy mayo in the mix. Nutritional yeast makes it taste super cheesy, and it’s all garnished with crispy bacon and green onion. Bring some crudites to the party for healthy dipping. Jalapeno poppers are more and more fun with each bite. Stuff ’em, wrap ’em, and bake ’em. Nobody could complain about something wrapped in bacon, after all. First, these are stuffed with a beef and onion filling before the good stuff is pinned onto the outside, all the healthy, flavorful fats blending together when the heat is added in. Yum! You could sub out beef for pork or turkey, too, and spice these however you like. The party don’t start until the chicken dip walks in. This BBQ dip is a spin on buffalo chicken dip which you could totally make instead, but this is going to be a new party fave amongst your friends for sure. It’s perfect for scooping up and gobbling with crudites like crunchy celery and carrots. You might want to make a double batch. We have an inkling people are going to want more where that came from! There’s no mac or cheese to be found here, but there is bacon… and that’s good enough. This low-carb “pasta” casserole is perfect for that cheesy pasta fix without all the carbs and dairy, making it 100% paleo-friendly and 100% devorable. What’s a paleo recipe roundup without some meat? Better yet, what’s a potluck without some meat? These main dishes are sure to satisfy and satiate. Wings are a summer potluck must. If you’re cooking for winter, simply swap out the peaches for a little something more seasonal like oranges or pomegranate instead. Either way, we know that fruit goes well with chicken. The sticky sweet sauce is something everyone will come back for more of, and you just can’t beat tender, fall-off-the-bone chicken. Plus, buying chicken on the bone with the skin on is budget-friendly, so you can really afford to cook for a crowd! Make these ahead of time and assemble them to cook fresh over the grill at a potluck. You’ll be everyone’s favorite pit-master! Or, you can easily cook them before you head out. Either way, these are easy to hand off to party guests as the night goes on. Finger food is a winner, and these even come without the mess (unlike wings!). Don’t skip out on the green sauce. Bringing a dish made in the slow cooker to a potluck is borderline genius. If you can turn it on low, the dish will stay hot while the pot is plugged in, so guests can dig into something that feels and tastes fresh. 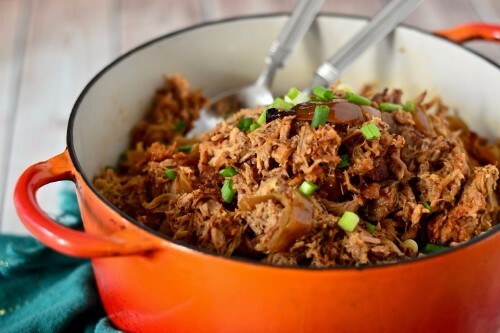 Pulled pork is always a hit. Bring a side of buns for those who can’t do without their bread, or leave them to simply pile the plate high. It also pairs beautifully with coleslaw or salad. Sloppy Joes are a fabulous sandwich meat. Fortunately, whether or not you skip the bread, with this recipe, you can skip the sugar and additives. Don’t buy the stuff in a can ever again. This couldn’t be easier to make, and you can very seamlessly translate the recipe to slow cooker whether you want a more hands-off approach, a way to keep your dish hot for the gathering, or both. Quiche and frittata is a lovely main dish to bring to a potluck. It’s easy for someone to grab and walk around with, and it certainly beats pizza. This Spanish tortilla is gluten-free, loaded with potatoes for a hearty filling. It’s also super cheap to make, so you could make a double serving if the party is big! There are two foods that are made for potlucks: buffalo chicken and casseroles. This dish marries the two for a show stopping treat everyone’s going to want seconds of. If you’re lucky enough to hold on to leftovers, this would make a decadent breakfast with an egg on top! Show up to the party with this and you won’t regret it for a second. When it’s all said and done, everyone’s going to want a little something sweet to cleanse their palate with. For more ideas where this came from, check out some of our favourite potluck-ready healthy tart recipes and keto cookies. One bowl is all you need to make this paleo magic happen. There’s no dairy, no grains, and no refined sugar in these divinely indulgent, perfectly fudgy, chewy-on-the-inside and crispy-on-the-outside brownies! There’s just something about bars at a potluck. They’re easy to grab and go, snagging a bite in between laughs and chats as you walk through the party. The portable dessert is just a great option. Turtle bars are doubly so, because double the chocolate = double the fun. They begin with a strong foundation of chocolate cookie layer, and they’re topped off with a caramel pecan layer before being drizzled with more chocolate. Poke cake is always a fun time. The idea is that you find little surprises in every bite – the berries are “poked” throughout. The cake itself is a winner with fruity flavors that you can customize entirely depending on the season or taste, a batter that you could make either vanilla or chocolate, and a coconut frosting. This is a light and fluffy dessert that everyone will love. Plus, it will make you look like a true Betty Crocker (when really, it’s pretty easy). The best part about pineapple upside-down cake is how it transfers from season to season. Summer BBQ? It works with a tropical twist and a garnish of seasonal berries. Holiday party? It has something about it that makes it the perfect dish to celebrate with. You can use fresh or canned fruit for it, and the presentation is always a showstopper. This version is grain-free for all your paleo baking needs. With a grain-free sugar cookie crust and a dairy-free coconut whipped topping, this fruit pizza will actually be a healthy option. Usually, at a potluck, it’s just fooling everyone as a big ol’ sugar rush in disguise! You can add seasonal fruit to the top for any occasion throughout the year. This crust recipe will be a dessert staple you’ll revisit for many recipes to come. Have fun and party safely! If you like these paleo potluck recipe ideas, consider sharing them with your friends on Facebook!